As I write this column in late January 2015, the January, February and March Class III futures are trading at $16.08, $14.98, and $14.63/cwt, respectively. If the January futures are close to what the actual Class III will be when announced in early February, then dairy producers will have experienced a drop in price of $5.86/cwt from November 2014, with the anticipation of an additional drop of $1 to $2/cwt in the incoming months. If the Class III futures are good predictors of prices to come (they often are not), then dairy producers will have to deal with Class III prices averaging $14.99/cwt in the first 6 months of the year and $15.50/cwt for 2015 in total. If you go back to the column that I wrote in the October 2014 issue of Buckeye Dairy News, you will find the explanations for this substantial price decline and why I also think that the actual milk prices will in fact be somewhat worse than what the futures markets are projecting. To compound the problem, there is a rampant fallacy in some reports that the feed markets have dropped in a proportion equal to milk prices. It is true that feeds are trading at substantially lower prices than at this time last year, but the decline in feed prices is nowhere close to the decline in milk prices. For many years now, I have kept track of the milk income and feed costs of a virtual Holstein dairy cow producing 70 lb/day of milk at 3.5% fat and 3.0% protein. The low components were chosen solely because these are the proportion assumed in the calculation of Class III prices. From a nutritional standpoint, we know quite accurately the nutrient requirements of this cow. So at any point in time, we can calculate quite accurately the cost of providing the major dietary nutrients. In Table 1, I compare the revenues (milk, completely based on Class III prices), and diet costs for this virtual cow in March 2014 and January 2015. Milk income will drop $7.22/cwt (31%) between March 2014 and January 2015. Meanwhile, the cost of feeding will have dropped by $1.90/cwt (17%). One must also remember that feed costs do not represent 100% of the cost of production. Consequently, our virtual cow, which was producing $11.36/cwt in income above diet costs in March 2014 is now projected to generate $6.97/cwt in January 2015. More importantly, this $6.97/cwt is roughly $0.50 to $1.00/cwt less than what we estimate is required to pay all other expenses on a typical Ohio dairy farm! Considering the lower anticipated Class III prices for at least the first half of the year, this means that the average Ohio dairy producer will be operating at a loss in months to come. To make this worse, I personally think that the futures prices are somewhat optimistic. My advice to dairy producers is to budget for 6 months of $14/cwt Class III prices ($15.00 to $15.50/cwt mailbox prices) in 2015. I might be overly pessimistic, but if I am wrong, producers will not suffer from a lack of preparation. And on the plus side, many producers have prepaid some expenses for 2015 using 2014 revenues. Thus, the situation will not be so bad on a cash basis – at least for a while. Table 1. Comparison of milk income, diet costs, and income over diet costs using Class III milk prices and feed prices for Northeast Ohio in March 2014 and January 2015. All is not doom and gloom! Feed markets keep changing. This brings significant opportunities not only to lock in very good prices on major commodities (e.g., corn, soybean meal), but also to evaluate how byproduct ingredients could fit your feeding program and lower your feed costs. As usual in this column, I used the software SESAME™ that we developed at Ohio State to price the important nutrients in dairy rations, to estimate break-even prices of all major commodities traded in Ohio, and to identify feedstuffs that currently are significantly underpriced as of January 24, 2015. Price estimates of net energy lactation (NEL, $/Mcal), metabolizable protein (MP, $/lb – MP is the sum of the digestible microbial protein and digestible rumen-undegradable protein of a feed), non-effective NDF (ne-NDF, $/lb), and effective NDF (e-NDF, $/lb) are reported in Table 2. Compared to its historical 6-year average of about 10¢/Mcal, NELis currently priced about right at 11.4¢/Mcal. This is important because a cow producing 70 lb/day of milk requires in the neighborhood of 33 Mcal/day of NEL. So, supplying the dietary energy required to produce milk is currently very average, but it still represents nearly 60% (i.e., $3.73/cow/day for our virtual cow) of total diet costs. For MP, its current price (54.1¢/lb) is nearly 2 times greater than its 6-year average (28¢/lb). It takes roughly 4.9 lb of MP to supply what is needed to produce 70 lb of milk. 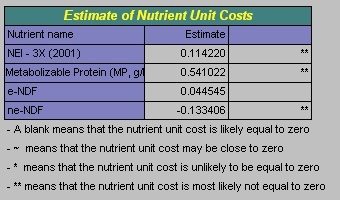 Thus, the cost of the dietary protein ($2.65/cow/day) is still much less than that of dietary energy. The cost of ne-NDF is currently discounted by the markets (i.e., feeds with a significant content of non-effective NDF are priced at a discount), and the discount of -13.3¢/lb is more than its 6-year average (-9¢/lb). Meanwhile, the unit cost of e-NDF is slightly above its 6-year average, being priced at 4.5¢/lb compared to the 6-year average (3.3¢/lb). Fortunately, a dairy cow requires only 10 to 11 lb/day of e-NDF, so the daily cost of providing this nutrient is only about $0.46/cow/day (i.e., 10.5 lb × $0.0445 per lb). 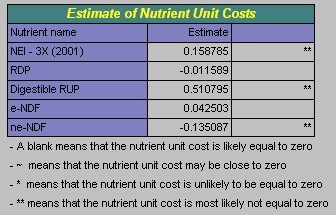 Besides, the dietary cost of e-NDF is completely negated by the negative cost of ne-NDF (3.5 lb/cow/day). dairy farms, January 24, 2015. Results of the Sesame analysis for central Ohio on January 24, 2015 are presented in Table 3. Detailed results for all 27 feed commodities are reported. The lower and upper limits mark the 75% confidence range for the predicted (break-even) prices. Feeds in the “Appraisal Set” were those for which we didn’t have a price. One must remember that Sesame compares all commodities at one point in time, mid January in this case. Thus, the results do not imply that the bargain feeds are cheap on a historical basis. For convenience, Table 4 summarizes the economic classification of feeds according to their outcome in the Sesame analysis. Table 4. Partitioning of feedstuffs, Ohio, January 24, 2015. As usual, I must remind the readers that these results do not mean that you can formulate a balanced diet using only feeds in the “bargains” column. Feeds in the “bargains” column offer savings opportunity and their usage should be maximized within the limits of a properly balanced diet. In addition, prices within a commodity type can vary considerably because of quality differences as well as non-nutritional value added by some suppliers in the form of nutritional services, blending, terms of credit, etc. Also, there are reasons that a feed might be a very good fit in your feeding program while not appearing in the “bargains” column. For example, your nutritionist might be using some molasses in your rations for reasons other than its NEL and MP contents. A few people have asked that I publish the results using the 5-nutrient group (i.e., replace metabolizable protein by rumen degradable protein and digestible rumen undegradable protein). 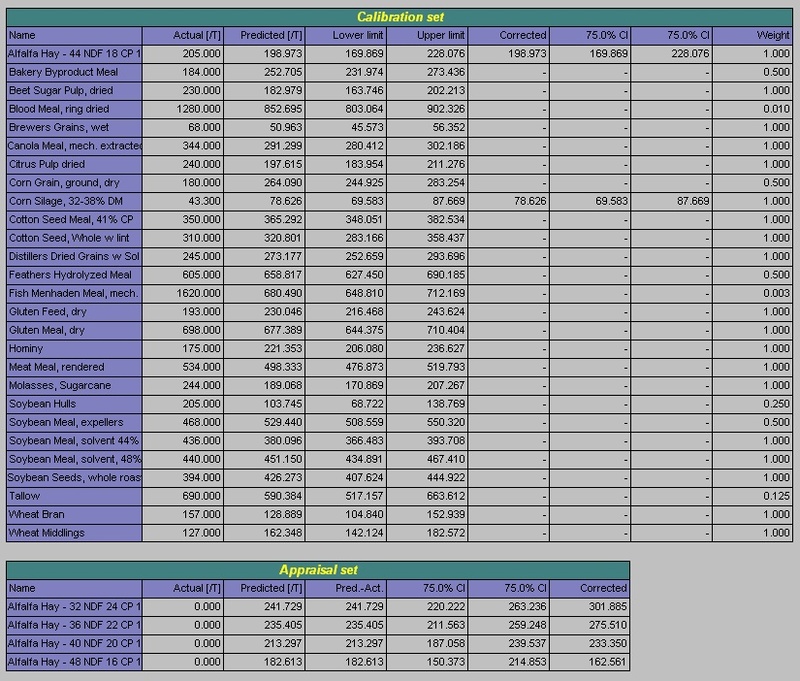 A table containing these results is provided herewith.